A planned 25,000-seat soccer stadium in Miami with no on-site parking remains a hot topic for those in charge of the city’s vast parking inventory. 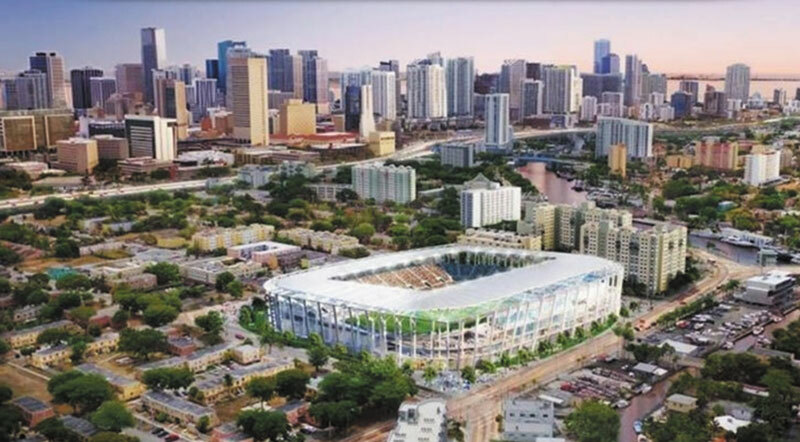 While the Miami Parking Authority – under the control of the Off-Street Parking Board – plans no formal role in the stadium project, the agency stands ready to assist if asked, said Authority CEO Art Noriega. When board members asked for his thoughts on the stadium proposal, Mr. Noriega made several points. The development group is on record that it will be limiting the number of events at the stadium, and there is no way it will be paying to build a parking garage for the facility, he said. The group intends to utilize existing parking lots and garages in the city, and expects to spend substantially to improve streets and sidewalks in, around and leading to the stadium, Mr. Noriega said. David Beckham’s group, Miami Beckham United, recently garnered a vital supportive vote from Miami-Dade commissioners, approving the sale of county land for the privately-funded facility. The move advances the Beckham group’s plan to construct the Major League Soccer stadium at 650 NW Eighth St. in Overtown. One day after that county vote, the parking board discussed the stadium. Board member Marlon Hill said he’s been intently following the progress, in light of the plan for no on-site parking, and he asked Mr. Noriega if the authority should “get ahead of it” or monitor the project. “It is entirely a soccer enterprise decision,” Mr. Noriega said. The group will dramatically improve the streets and sidewalks, “invest in infrastructure … and create park and walk opportunities,” he said. Mr. Noriega said he’s had a lot of conversation with David Beckham’s group about the planned stadium. For soccer fans, “it’s a very walkable sport,” he said. Since announcing the Overtown site and its plan for no on-site parking, the group has promoted the tradition of walking to the game. “It’s done in Europe and South America,” Mr. Noriega told the parking board. Mr. Noriega said “the reality of economics” is also a factor. He said the group says it will limit the stadium to 30 to 40 events a year. The Beckham group intends to “activate existing inventory,” he said, with one of the most likely locations being the county-owned garage at 701 NW First Court known as Overtown Transit Village. It’s empty and vacant at night, Mr. Noriega told the board, and it’s closed weekends. That facility is about five blocks due east of the stadium site and has about 886 spaces. In one of its presentations on the planned stadium, the developer said it’s about a 10-minute walk. To the north of the stadium site is the Culmer Metrorail Station, about a 4½-minute walk, the developer says. The developer’s presentation also identifies two other nearby transit stations and other parking facilities. After buying the bulk of the Overtown site, Miami Beckham United said it was taking a responsible approach to planning by engaging the community, emphasizing the location’s access to public transit and prioritizing walkability. The stadium site is within walking distance of downtown Miami, the group said, and just two blocks from the Miami River. Water taxis have been touted as one way to get to and from the stadium. “The Culmer Metrorail Station is three blocks away, 7,000 parking spaces are within a 10-minute walk, and All Aboard Florida’s new rail terminal is within a half-mile, ensuring fans will have several options for arriving and departing on game day,” the group said. In a presentation to the community, the group put forth what it calls a comprehensive traffic management plan that includes: Maximize existing parking supply; minimize day-of-game traffic impact by accessing the existing parking infrastructure in and around the site; encourage fans to ride public transportation through ticket bundles and financial incentives to ride public transit, car pool and walk to the stadium. The group has also said it’s willing to secure parking for at least 2,000 vehicles for stadium event days in garages or other public parking lots in the Civic Center or downtown Miami and a shuttle from the garages. Speaking of the off-site parking opportunities and encouraging public transit use by soccer fans, Mr. Noriega said the key will be promotion on the part of Miami Beckham United. He said he has extended an open-ended offer to the Beckham group for the authority to be a resource as it moves forward with building the stadium. Ultimately, a decision on a stadium with no parking is up to city planning and zoning officials and perhaps city commissioners. The Beckham group expects to begin talks with city officials in about six months. Free tickets and David Beckham picking up fans personally is the only way this thing will fly with no on-site parking and a combat zone to walk through. This appears to be a romance where the groom has given up and “settled” for anyone that will take him and in so doing, has lowered his expectations about his future. Case in point: what was once a stunning stadium design has “settled” into a nondescript, cut-rate resurrection of the old Miami Stadium http://bit.ly/2sA5J3o that once stood at 23rd St and NW 10th Ave. At least it had parking. Well, it is clear that this group does not understand Miami. Whereas the concept of walking to a game seems lovely the reality is that Miamian’s will not walk very far. Think heat, rain, Overtown. What about residents? Limiting events to 30 to 40 per year is equal to 3 to 4 per month. This might not be a high price neighborhood but those residents deserve to enjoy their neighborhoods peacefully. Mr. Beckham you have been sold a losing location. Find a better spot. Your league need to understand downtown Miami is not the place to build a successful stadium. Move on. Orlando suffers from the same heat, humidity…in fact so does Dallas and Houston yet their fans walk that 1/2 mile. The furthest spaces and overflow lot at Hard Rock is a good walk too, yet Dolphin fans do it all the time. Back in UM’s Orange Bowl days, thousands walked from the county courthouse parking lot, over the bridge, almost 1 mile. Again, without problems. Don’t be quick to dismiss. Lets address water taxis, another magic stone in Miami. Water taxis are for tourists. Don’t invest public dollars into tourist gimmicks. Let private businesses do that. The City and County must stop acting like publicly subsidized businesses. They should be assisting small businesses that create local jobs to thrive. The head of parking references Europe and S America where “it’s done” but forgets to mention (or chooses not to) that probably all the cities he is referencing have extensive local rail – above and below ground – systems, in place. Metrorail is the beginning of a system which covers almost a miniscule portion of the county and can’t even be compared to most cities mass transit in those places. Maybe the stadium’s ok anyway, but the head of parking using that as justification for support, shows something other then transparency. Head of parking claiming we’ll be like many european and s american cities … not needing parking, is way off. Those places have extensive local rail mass transit sytems. There isn’t just a station nearby, but many trains to get you home. We don’t have anything close to that. Whether we like or not the stadium, Noriego shouldn’t be selling us the plan, by misrepresenting the facts. That is not what he is paid for. It is bizarre how fervent the comments are defending a status quo that no one actually trying to drive in Miami would fail to recognize as overburdened. BOOO!! Change is coming and it’s scary. Change is not scary. Stupid plans are scary. This is a stupid plan. Let’s give the team a fighting chance by placing it where fans will travel.